Rómulo Gallegos is a municipality in Cojedes State (Venezuela) Flag at <romulogallegos-cojedes.gov.ve>. General information in Spanish Wikipedia (no English Wikipedia page at the moment). 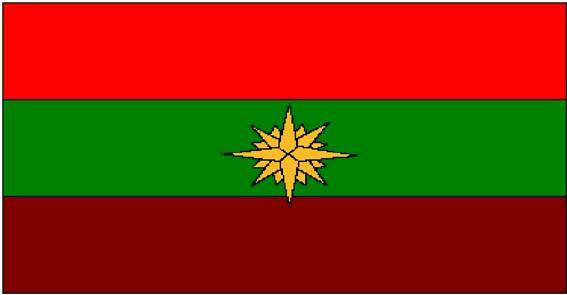 The flag is a horizontal tricolor of red, dark green and dark brown with a golden yelloe 16-pointed windrose in the middle, tangent to the green stripe (the image shows is to overlap onto the brown panel and yet not even touch the red-green boundary, wich must be a depicting mistake). The windrose is lined in black and faceted, consisting on a larger four-pointed star placed on a smaller one, in turn placed on an even stockier eight-pointed star, in windrose fashion. This windrose is shown as such (complete with N, S, E and W letters) on the bottom half of the local "Coat of Arms" emblem. The original image shows the windrose boxed in a 104×140 px boundary, suggesting that the original artwork was stretched horizontally some 135%, suggesting the actual ratio to be ~3:4.